Early on, we recognized that to truly be a one-stop, total car care facility, we had to be able to take care of all our client’s needs, including towing and road service. Yeck's Tire and Auto in Bellevue offers Towing & Road Service for Cars, Vans, Trucks and Motor Homes in the Eastern Nebraska area. We work on all makes and models of cars, trucks and SUV's. We perform all types of maintenance and repairs including: oil changes, a/c & heater, alignments, front end & suspension, tires, brakes, cooling system, electrical, exhaust, clutches, engine repair, automatic & manual transmissions, 4WD, differentials, timing belts, tune-ups, and all types of testing and diagnostics. 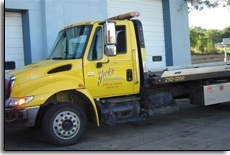 We provide emergency towing service. Whether it's a minor or major repair, Yeck's Tire & Auto Repair can absolutely handle all your service needs! We are truly your one-stop, total car care facility. After 40 years in business, you know we're not going anywhere. Come in and discover why Yeck's Tire & Auto Repair won the prestigious AAA "Top Shop" award for the state of Nebraska.